Most businesses are built on a very understandable, palatable concept: find a problem, solve the problem, and sell it to the people who have the problem. This is a surefire way to make money in the 21st century, because much of the upfront work has already been done. While many people who want to make a living provide for themselves by solving direct problems, there is a vast number of others who want to make a living doing something that doesn’t solve a direct problem. How do you come up with a price for your art? How do you determine the value of those snazzy jeans you designed? Why do people spend their money on certain things and not others? What do you do when your product doesn’t provide any sort of monetary return? This episode is the first of a four-part series. 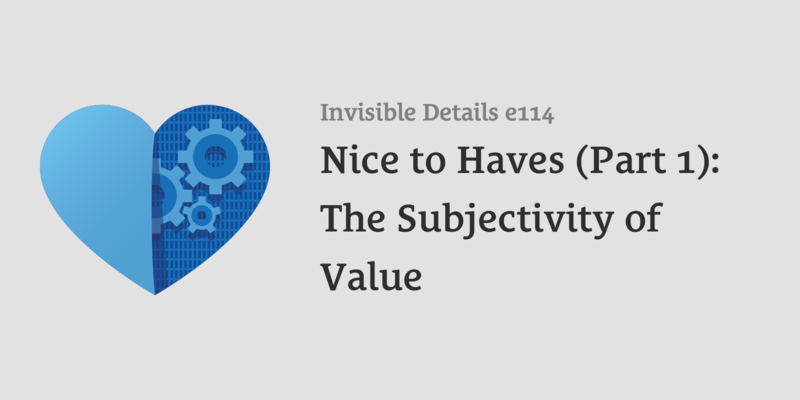 We’ll be talking about the subjectivity of value and how to start on the path to developing a brand based around what some would call “nice to haves”. Value is subjective. What one person deems valuable may be completely worthless to someone else. The value of something is determined when two parties agree upon some kind of exchange. People will pay more if the product has a certain experience connected to it. Almost every problem that we hire out or purchase products to solve are because we invented problems we now need to solve. To most customers, a nice to have is more about who they become on the other side of the purchase. Successful businesses that sell nice to have products solve indirect problems or meet desires that their target customer has. People only buy things they desire. They desire an outcome or a lifestyle and will pay to get that. The list of things we truly need is short, and most of the things that are considered “need to have” could be seen as “nice to have”. There are many different types of value than just monetary value. Marketing done right is not a con game. Good marketing is finding the commonality between your product and the person who desires your product. It is nearly impossible to simply create a product, announce it, and get people to buy it. You need to craft a story and build something that people actually desire. Become a student of your customers so you know and can relate to who they are and what they want.